With iOS 6 having just been announced, the beta version of the upcoming firmware has now been seeded. And, as usual, this first released build of iOS 6 beta is only available to registered members of Apple’s developer program, so if you’re a non-developer hoping to catch a glimpse of the future, sadly, you’re going to have to wait. Although iOS 5 certainly alleviated many pet peeves within Apple’s mobile OS, there’s always room for improvement, and if the showcasing of iOS 6 at WWDC is anything to go by, then iPhone, iPad and iPod touch users will be in for a treat once the new software drops later this year. Of the well-documented array of features, the new Maps services from Apple is arguably the clincher, although native Facebook integration will certainly go down well. With Twitter already welded into iOS as of last October, it was inevitable that Mark Zuckerberg’s company would get in on the act, and the more social amongst us will certainly reap the benefits when using both native and third-party apps. Given that this is the very first beta, it’s likely to have a few bugs, although I suspect those downloading will initially just be anxious to assess the foundations and grab a hands-on preview of the brand new software – that’s certainly my intention! As ever, there are likely to be various leaks via the usual download mediums of iOS 6b1, but we strongly advise against installing these on your device. Besides being potentially dangerous – after all, anybody could have messed with them before they reach your downloads folder, it’s actually illegal, and Apple has been known to pounce dogmatically on those found to be running illegal versions of unreleased software. Scaremongering aside, since it only costs $99 per year to register as an Apple developer, you really ought to just sign-up legally if you’ve got a vested interest in upcoming iOS software. Not only is it great for previewing features limited from the end-user, but it’s an awesome way to learn more about the inner frameworks of iOS as a whole. We’re likely to see quite a few betas before the official release, all of which will bring various updates and improvements, so stay tuned to our coverage here at Redmond Pie for our round-the-clock commentary. 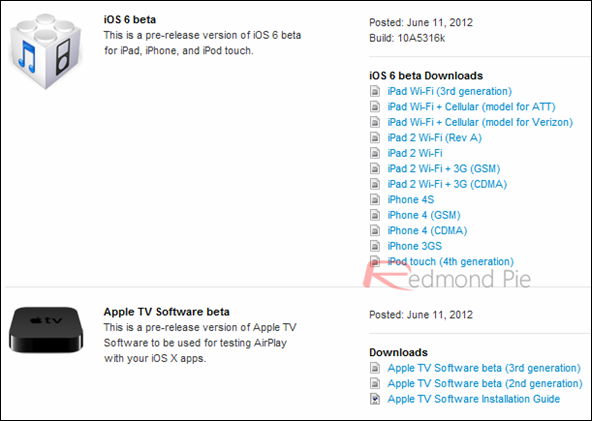 iOS 6 beta can be downloaded officially from iOS Dev Center.